At 2pm on Sunday, local songwriter & caricaturist Bill Dougal will play songs from his days leading pun-rockers Billy & the Buttons along with a few of his newer tunes. 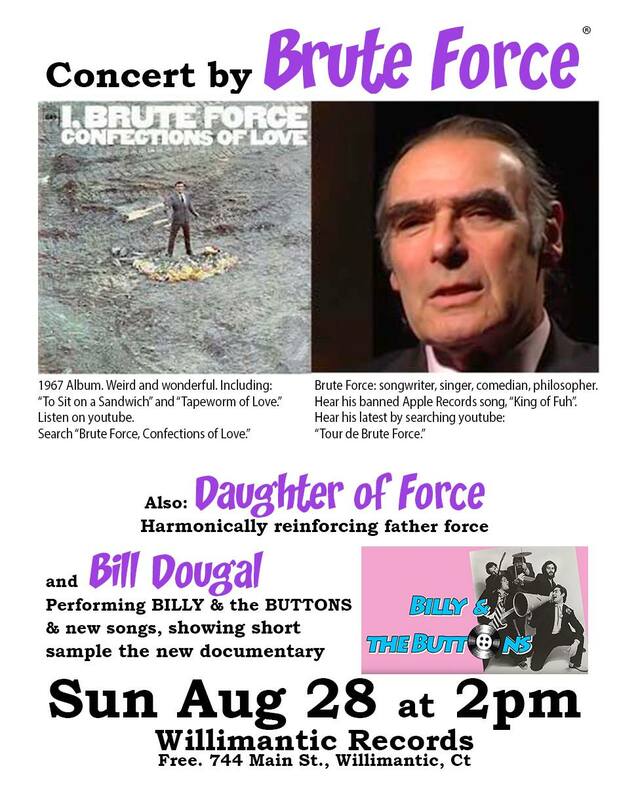 Bill will also screen a preview of the upcoming Billy & the Buttons documentary. Brute Force, accompanied by Daughter of Force, will follow with a career spanning set of Brute Force compositions. Best known for his controversial "The King of Fuh" single on The Beatles' Apple Records label, Brute Force (a.k.a. comedian Stephen Friedland) has written thousands of songs, many of which were recorded by The Chiffons, Del Shannon, The Cyrkle, The Tokens, Bernadette Peters, Little Peggy March, Chubby Checker, Tammy St. John, and dozens of other artists in the 1960s. Brute's two solo LPs, Confections of Love (1967) and Extemporaneous (1971), are both highly sought after by diehard collectors of psychedelic pop novelty vinyl artifacts. Below is a bit more about "The King of Fuh" as well as a few youtube links. There will be no admission charge for the Willimantic Records show, but donations to the musicians will be welcomed and encouraged.